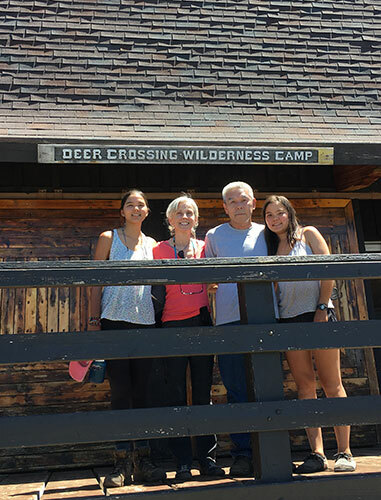 Seeing our wilderness location in person will help you relate to your camper’s experience and understand how camp operates. Camp tours are scheduled on the first day of each session. Reservations: Contact camp’s Bay Area Office to reserve a spot on the tour at least three days in advance to ensure that staff are available. Guided by one of our staff, you will hike into camp, tour the campground and enjoy light refreshments, and hike back out to your car. It is a 2.5-mile, 45–60 minute hike each way. Wear comfortable hiking shoes or boots, long pants, long sleeves, and jacket (Sierra weather can be quite changeable, so this is “just in case”). Bring water (potable water is available near the Loon Lake boat launch ramp), sunscreen, and bug repellent. Remember the elevation at Deer Crossing is nearly 6,500 feet!